We have mentioned before that passive lowpass and highpass filters described in Electronics books may well be designed through a set of mathematical formulas but the latter assume the presence of a purely resistive load. 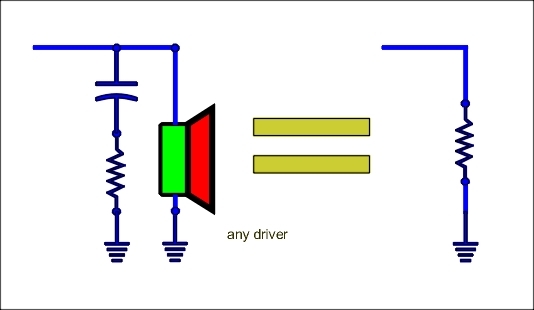 Since a loudspeaker driver is a complex load we can not make use of these formulas. 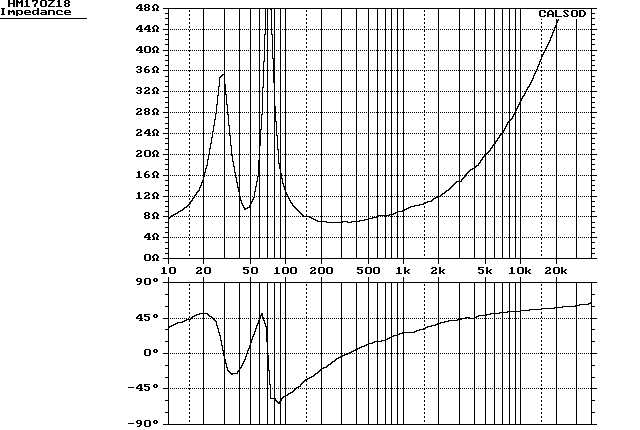 Generally speaking loudspeakers' complex impedance gives passive filters a very hard time. For this reason we can make use of a correction technique known as 'Complex impedance Compensation'. Since loudspeakers in a wide frequency area (ie.above their resonance) behave like a series RL circuit (ie.resistor-inductance) we can place in parallel to them an RC circuit (ie.resistor-capacitor) the impedance of which cancels out the imaginary part of the loudspeaker's impedance. The RC subcircuit would produce ideal results if the loudspeaker were really behaving like an RL circuit. 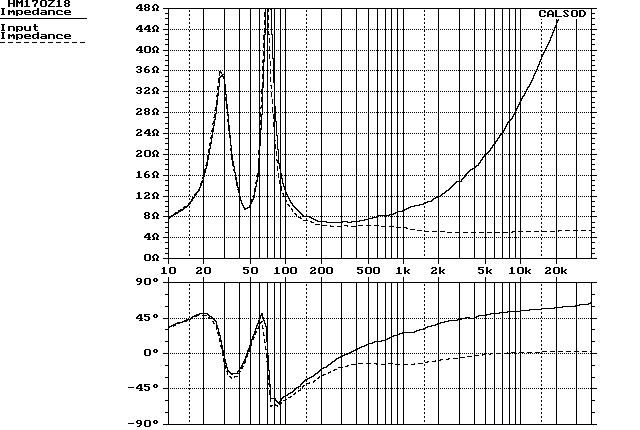 Loudspeakers can be modelled as such an RL circuit in a rather limited frequency range because in this model their equivalent inductance is changing with frequency. Even though this approach can work extremely well in a crossover network. However the use of compensation RC subcircuits involves design manhours, component cost and pcb complexity. So it' adoption should be considered in relation to the speaker's category. In the case of real-world loudspeakers these formulas provide rough estimates that can be used as startup values in our simulation software. Let us give an example of the way we can optimize the RC subcircuit for a woofer and a tweeter driver. The overall process does not need the highest level of accuracy. We could pick another capacitance value that would give a perfectly straight curve at 8 ohms. This would not be practical : we should have to use multiple capacitors with increased cost and crossover pcb complexity. Apparently we do not deal with impedance anomalies below 100-200Hz. They do not affect the operation of our crossover lowpass filters and their compensation would engage extremely high values of inductance (about a hundred of mH) and capacitance (hundreds of uF) of unimaginable cost and heat dissipation. We can observe the zero phase value of the compensated impedance at high frequencies. Such a phase value indicates a purely resistive load. However the strong resonance peak is unaffected and may influence the operation of our highpass filter. Most quality tweeters have a back chamber that lowers the frequency and the strength of this resonance. So in most cases this resonance will be mild and below 800Hz with no influence on our highpass filter design. 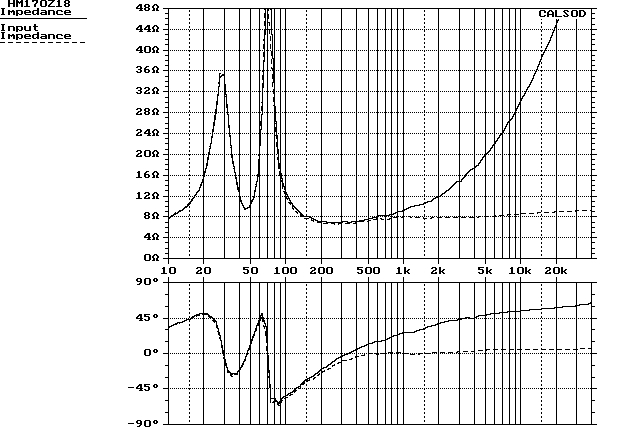 If we wish to treat such loudspeaker impedance resonances we must place in parallel to the driver a compensating RLC subcircuit. Parallel RLC circuits are inactive at very low and very high frequencies. They become active around their own resonance frequency and when that happens they behave as pure resistors. In the case of the previous tweeter we want to suppress the impedance peak of 32 ohms approx. with a parallel RLC circuit. We want to have a total impedance of 6.5-7.0 at resonance frequency. We must choose its R value to produce a parallel combination with the driver's 32 ohms at around 6.5-7.0 ohms. R is thus estimated to be around 8.20 ohms. There are many pairs of L,C values that match a specific resonance frequency. Changing them simply narrows or broadens the bell shape of the resonance. So only a tight range of values will provide the right compensation. We can either spent some time in our software looking for the right L,C pair or let it search for the optimum values. It depends on the program's features. In this case the optimum RLC subcircuit was found to comprise an 8.2 ohm resistor, a 14uF capacitor (perhaps a 15uF should be used instead) and a 1mH air inductor. Its effectiveness is unquestionable as shown by the dashed impedance curve in the following plot. The evaluation of this plot assumes the presence of both the RLC and the previously presented RC subcircuits. -Why shouldn't we always use RLC subcircuits for impedance correction of both woofer and tweeter resonance peaks during crossover design ? It is true that these impedance peaks interfere with crossover filter operation only at frequencies where the latter introduces signal roll-off. Consequently woofer impedance peak is not a problem for no low-pass filter is expected to start cut-off below 100-200Hz (Car audio subwoofers are an exception where special care has to be taken). 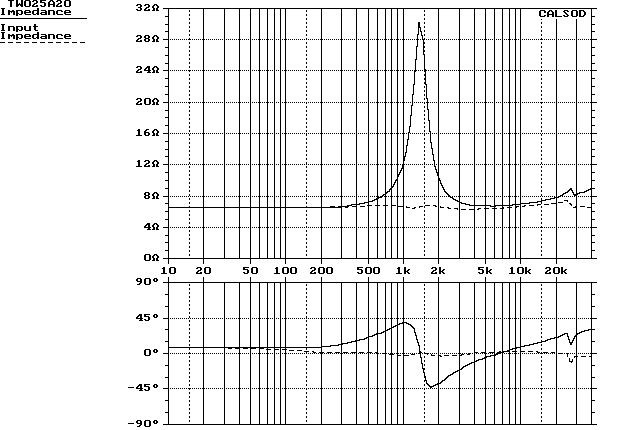 High-pass filters already provide strong signal suppression below 800Hz so they are immune to tweeter impedance anomalies below 800Hz : chambered tweeters have their resonance below 800Hz. However tweeters with no chamber and higher resonance frequencies will disorientate high-pass filter operation and the designer as well! 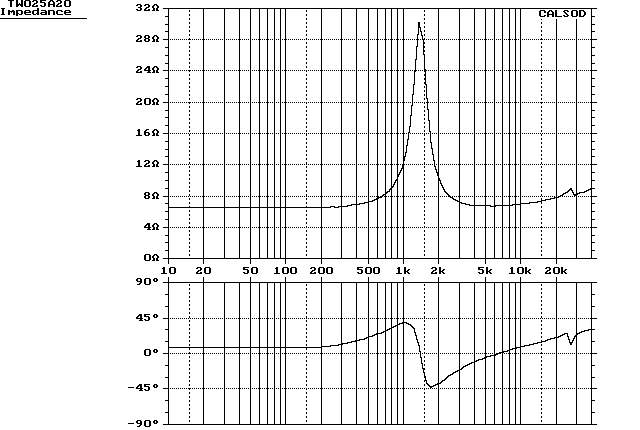 It is also true that RLC component values become very large as driver's resonant frequency lowers. For example we will need inductors of 20mH or more with very thick wire for impedance correction of a woofer driver in a closed or a vented-box design where resonant frequencies are well below 200Hz. Not to mention the hundreds of uF for capacitors. In addition heat dissipation will eventually make the whole idea inefficient. Unchambered tweeters' impedance is a different case. If a higher-cost crossover network can be tolerated we should try to 'compensate' their impedance resonance as presented in the paragraphs above. Conclusively using impedance compensation subcircuits depends on the relative position of driver impedance anomalies and filters' cutoff frequencies. If these are not close enough then the designer could avoid this part of crossover design. Another parameter that plays a key role in this decision is the speaker's category. Cheap speakers in the market do not incorporate such solutions.